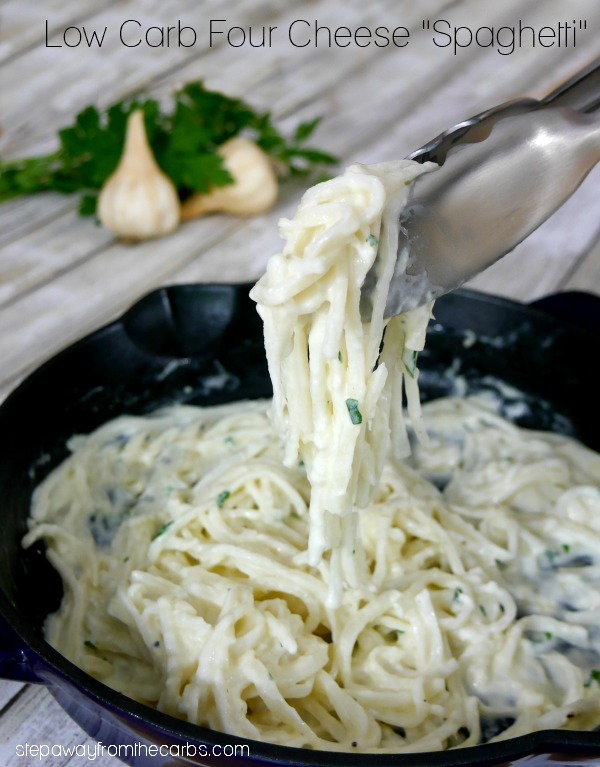 Here are some low carb spaghetti and noodle alternatives for when you’re craving pasta, but want to stay healthy! Along with bread, pizza, and sweet treats, finding good alternatives to pasta is one of the big issues that many low-carbers face. When it comes to a dish like lasagna, then there are other options like thinly sliced zucchini, cabbage, or low carb tortillas. But what about finding alternatives to spaghetti and noodles? Keep reading for my favorite low carb suggestions (and some “healthy” alternatives that you’ll want to avoid!). 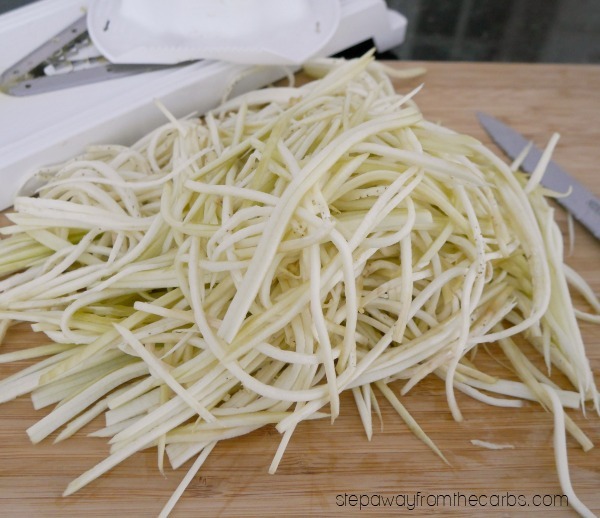 When cooked, this squash can be shredded into spaghetti-like strands. It’s a super healthy alternative with approximately 5.5g net carbs per cup. It’s also a great source of folic acid, potassium, and vitamin A! 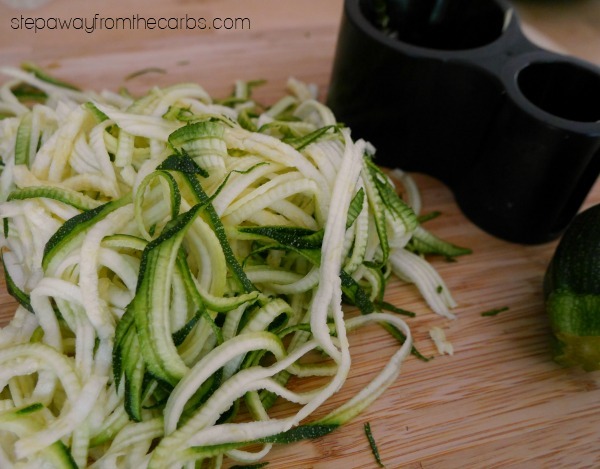 Making noodles out of vegetables (especially with a spiralizer!) has become so popular that it is now easy to buy them ready prepared! Zucchini is definitely the best choice for low carbers, as it contains around 4g net carbs per medium zucchini. They can get too watery, though, so when I’m preparing them I make sure I don’t include the core. These zero-carb pasta alternatives come in a range of shapes – including spaghetti! 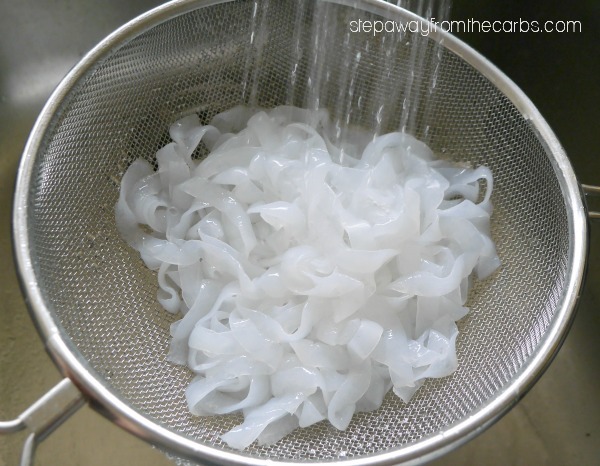 They can be really useful for low carbers if prepared correctly – so check out my Ultimate Guide to Shirataki Noodles for my top tips! I only recently just tried these – and I loved the texture, If you find zoodles too watery, try eggplant instead! There are SO many options here – my best suggestion is to head over to somewhere like Netrition, read the ingredients and carb count and try some out. One brand I *have* tried (and loved) is the penne from the Great Low Carb Bread Company. They don’t make spaghetti, but they do make fettuccine, which is 7g net carbs per serving. Just a quick note on low carb pasta brands. Dreamfields is widely available but I’m afraid I don’t endorse it. The stats make me very uneasy. Read by review of Palmini Noodles which are made from hearts of palm. I was really impressed! I also made a fantastic Four Cheese sauce to go with them! Yes – they’re really a thing! They’re made from mung bean and edamame, and you can buy them on Amazon in both spaghetti and fettucini styles! They have a neutral taste and a texture like regular wholewheat spaghetti. Very good – and only 3g net carbs per generous serving! They’d be perfect with my Slow Cooker Bolognese Sauce! So what about the other low carb spaghetti alternatives that you hear about all the time? They may be OK for those trying to eat more healthily or anyone following a gluten free diet, but here’s why I believe these options are *not* OK for us! 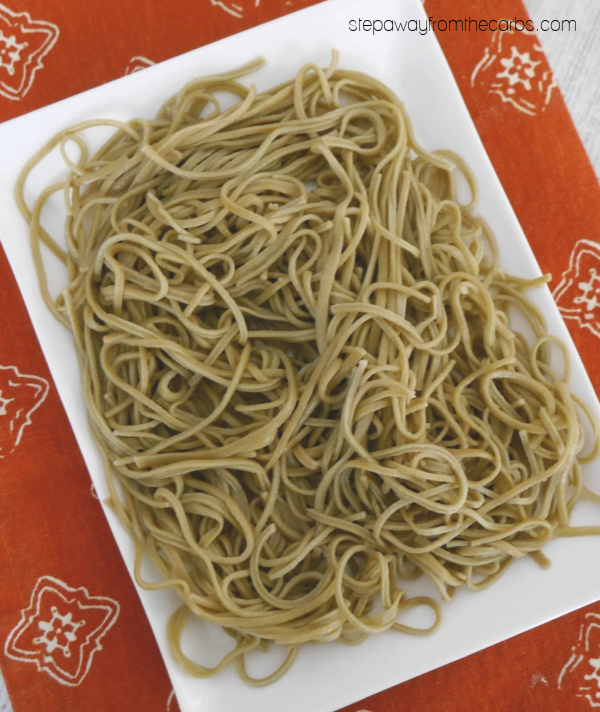 Made from buckwheat flour, soba noodles contain around 24g net carbs per cup. Gluten free – yes. 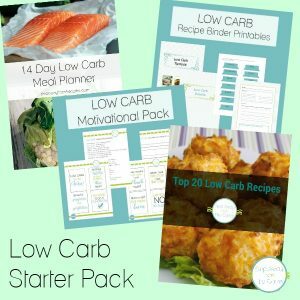 Low carb – no! 42g net carbs per cup!! Although a great source of fiber, beta-carotene and vitamin C, these noodles contain about 24g net carbs per cup. As you probably know, beans are generally high in carbs – and this pasta alternative weighs in at approximately 33g net carbs per cup. Now these might be borderline for some low-carbers, containing just 11g net carbs per cup. It’s your decision with these – but too high for me! Do you have any other low carb spaghetti alternatives that I’ve missed? Let me know in the comments! 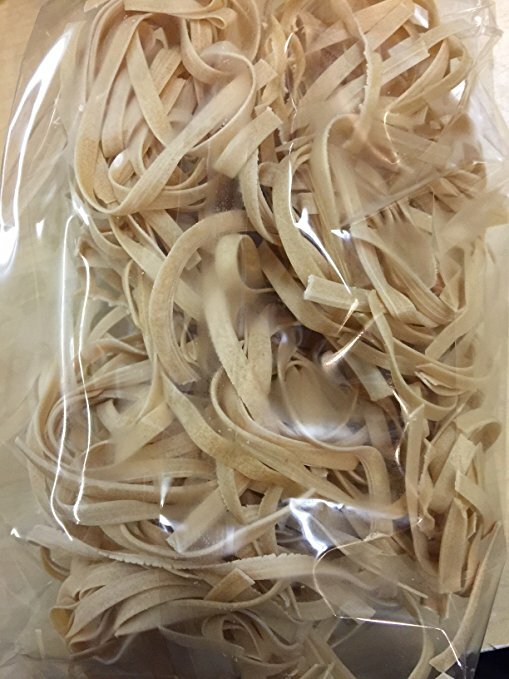 Kelp noodles. Can use them crunchy for a salad or let them soak longer fir soft noodles. I have some of these ready to try! I’ll add them to this list as soon as I’ve tested them!